Developed by the Delbard nursery in France in the 1950s, this is an another attempt to improve on Golden Delicious - and a pretty successful one at that. It is very attractive in appearance, with the light yellow / green of Golden Delicious overlaid with lovely red and orange stripes. Estivale has been marketed under a number of names so you might have heard of it as Delbarestivale, Monidel, Dalili, Ambassy or Delcorf Estivale. Estivale is an early apple variety, grown commercially on a small scale in France and England, and usually available in early to mid September. Many early apple varieties are related to Worcester Pearmain, so Estivale, with its Golden Delicious parentage, is an interesting contrast. Whilst still a sharp apple, Estivale is inherently sweeter and we think has a better balance of sweet and sharp than some of the Worcester Pearmain offspring. The flavour is fairly typical of a modern early variety, being sweet but with a bit more acid to it than Golden Delicious, and therefore rather more refreshing. There is a hint of strawberry and even pear. The flesh is cream, and quite crisp when fresh. Its main drawback is that it bruises quite easily, although unlike many early varieties it does not go soft within a couple of days of picking. In short, this is a pleasant summery apple, and one of the best early apple varieties. This apple is sweet and very aromatic for an early apple. If not thinned, the apples are 2 inches in diameter. Soft flesh. To be eaten soon as it goes mealy within a month. A beautiful apple - crisp, sweet, refreshing. I came across it branded as "British apples" in Lidl, and very much hope to find it again! Generally poor with very little depth of flavour. Another curse of the Golden D... Plus points: Looks nice Initial hit of sweetness is enjoyable Minus points: No depth of flavour at all, very snappy sour aftertaste. A thoroughly bland apple full of juice but not flavour. I think unfortunately this another case of what's good for the industrial grower (getting out a heavy cropper early to the stores) and not what is good for the consumer. Came upon this apple at a grocery in the southern part of The Netherlands. This apple did not look very interesting or appealing, but since I did not know this variety, I had to taste it. Took a bite.....it had totally NO taste, but was very juicy, disturbed balance of sweet and sharp. I could only conclude this apple was picked too early, but it had something in it I liked. Next step: Bought a tree at my favourite nursery, grew some apples and let them ripen properly! This apple is remarkable, perfect sweet/tart balance there is. Strait from the tree, some hints of roses, anise and some other fague flavours I cannot define. Nice fine texture, very juicy. very little scap on the apples. One of my favourite early apples. Very reliable cropper. It is a heavy cropper and needs to be thinned to get decent size apples. My thinning formula is 4 apples a branch. Needs to be picked successionally. I'm going to graft some more of these. In The Netherlands this apple is called 'Delcorf'. Bought some of these today from the little greengrocer at the bottom of my road. They're lovely - sweet, tasty, juicy and crisp. I'd never heard of them, and nor had the greengrocer, so I did a web search and found this site. I'll tell the greengrocer what I've found out! Bought Delbard Estivale from M & S yesterday, Rob Simpson, Herefordshire grower. Really nice, better than tasteless French Golden Delicious but still waiting for Coxes ! Fruit tree sold by Lidl and incorrectly labeled as Bramley. 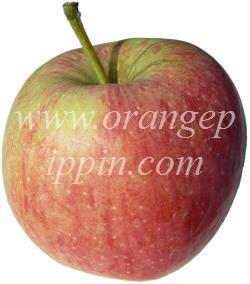 Apple identified by Wisley gardens as Estivale. The crispest and juiciest apple I have ever tasted. I totally agree with the tasting notes. The only drawback with this variety is that it is a very poor keeper and needs to be eaten when freshly picked. Eaten in season it is second only to Cox's Orange Pippen (comparison out of season not yet undertaken. Rather expensive compared with most other preferred apples.